Floral design has come a long way, and this arrangement is representative of peak floral design. 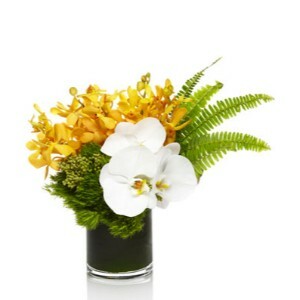 This is a grouped arrangement of yellow mokara orchids, green trick dianthus, white phalaenopsis orchids and tropical ferns. Show that special someone who loves flowers that you care with this amazing arrangement.